The Centers for Disease Control and Prevention’s National Institute for Occupational Safety and Health (NIOSH), along with the U.S. Department of Labor’s Occupational Safety and Health Administration (OSHA) updated and redesigned its Heat Safety Tool, an app developed to help workers stay safe when working outdoors in hot weather. 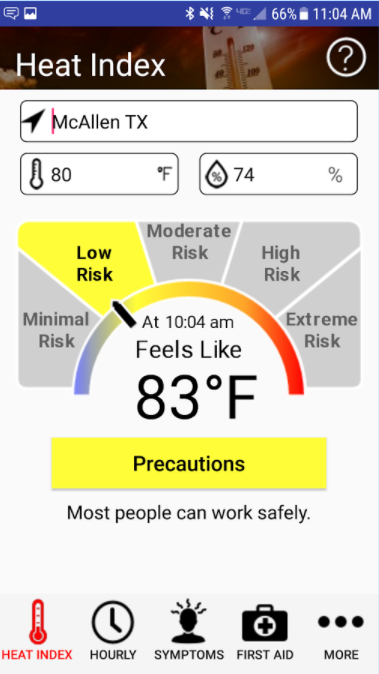 The OSHA-NIOSH Heat Safety Tool mobile app, available for iOS and Android devices, determines heat index values—a measure for how hot it feels—based on temperature and humidity. The free app uses the device’s geolocation capabilities to pull temperature and humidity data from National Oceanic and Atmospheric Administration satellites to determine the heat index. The app shows the current risk level—minimal, low, moderate, high or extreme—and forecasts the hourly heat index throughout the entire workday giving employers information they can use to adjust the work environment as needed to protect workers. Extreme heat causes more deaths than any other weather-related hazard. Each year more than 65,000 people seek medical treatment for extreme heat exposure. In 2014 alone, 2,630 workers suffered from heat-related illness, and 18 died from heat stroke and related causes on the job, according to OSHA. In October 2016, OSHA cited an Indiana landscaping company, Townsend Tree Service, for the heatstroke death of a 23-year-old crewmember.